Order Now For Free Delivery Within Perth Metro Area. 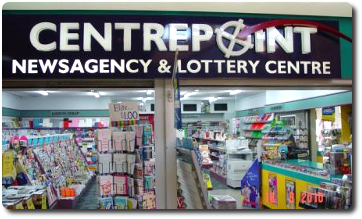 You will also find lots of information about all we have to offer in our newsagency, including Lotterywest and Centrepoint Midland Licensed Post Office, located at Shop 18-19, 307 Great Eastern Hwy, Midland WA, just follow the links on the Newsagency, Post Office and Lotterywest menus on the right. Shop 18-19, 307 Great Eastern Hwy, Midland WA 6056.